I can almost hear Rod Roddy, the late great announcer for “The Price Is Right,” calling out what we just won. Hmmmm … first off, TPIR doesn’t give away new houses and second, he’s dead. So that new house we ended up with? A lot like our old one … it just looks brand new. There are some professions in the world that must be so rewarding. Jobs which result in such joy, such happiness that people practically (and in some cases, actually) hug you in glee after you’ve performed your craft. The surgeon who saves a loved one’s life. The lawyer who defends little David against the big bad corporate Goliath. The firefighter who rescues the family dog from a burning home. As a general rule of thumb, construction trades don’t fall into the “I thanked God the day you were born!” status. Oh sure…you do your job well and people are thrilled at what you did for them, but genuflecting? That’s reserved for the likes of Steve Jobs, Ron Popeil and Oprah (come on, you know we’re all blessed to live in her lifetime) – all people who change our lives in ways we may not even realize. You have a contractor do a major renovation, and you’re almost as happy to see the crew of workers finally pack up for good as you are with the job they did. 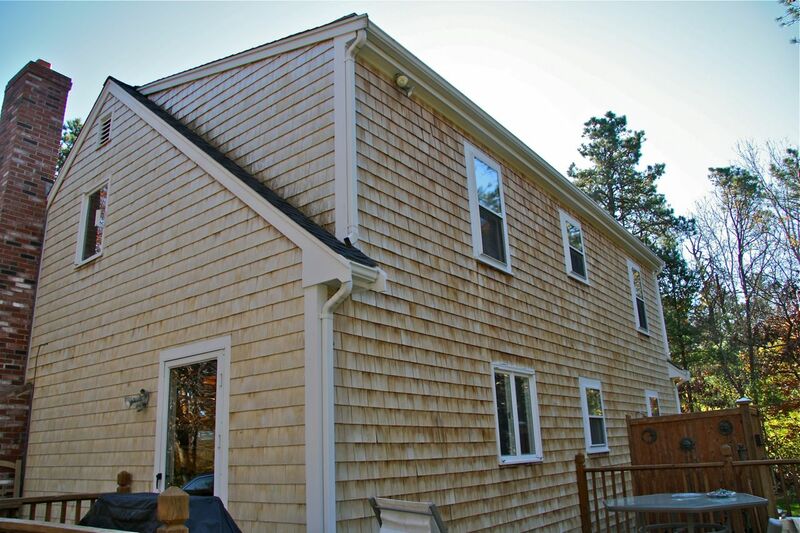 Stewart Housewashing, a division of Stewart Painting, is one of those companies spreading good cheer throughout the greater Cape Cod area. Their house-washing truck is the ice cream truck for adults, minus the bells. OK, maybe we grown-ups don’t go running out into the streets when we hear the house-washing truck coming like we do for the ice cream truck. What, you don’t anymore? Honestly, I can’t let that musical tin can of tastiness go by without dropping off a few chip-wiches. Anyway, when the house-washing truck leaves, it leaves to grateful smiles as big as the smiles that are loaded with chocolate chips. It really should have bells on it. Byron washing away years of dirt and mold. Ugh, I’ve got to paint that bulkhead! House-washing is one of those things that has been on the “should-do” list for a while at the Egan house. The house is 24 years old, so there’s 24 years of dirt and mold accumulated on the shingles. So I asked Sheldon Stewart to send the truck over and give our house a wash. A couple of weeks ago Byron & John pulled up at 9am on Saturday. Their arrival was met with, “Oh, right! The house is getting washed today!” Good thing we weren’t the first house on the list for that day. After a mad scramble to get dressed, I went out and met the guys who said they’d be done in about an hour. An hour? But how long until the shingles look clean? “About 30 seconds after we apply the solution,” was the reply. Wow. The “solution” is a mix of bleach, water and a product called Jo Max. Jo Max is an additive that boosts the cleaning power of bleach to kill the mold & mildew, yet it also neutralizes the harmful effects that the bleach would have on your plantings around the house. I know, it doesn’t make sense that it could do both, but what can I say? It just does. Byron and John fired up the pump on the back of the truck and got to work. Byron sprayed the solution onto the house with a low pressure wash. It had the strength of a garden hose, just strong enough to reach the trim and shingles at the peak of the house. John followed with a hose that rinsed the solution, and most importantly, the dirt and mold off the house. John also sprayed down the foundation plants with water for extra protection against the bleach and Jo Max mixture. These two wizards of house-washing worked their way around the house, even hitting the outdoor shower and back deck along the way. As you can see from the “during” picture, the shingles were brightening right in front of our eyes! It was pretty cool to watch. A little more than an hour later Byron and John were all wrapped up, and Cori was fighting the strong urge to hug them. We settled for more of a Billy Crystal/Carol Kane send-off from The Princess Bride, standing in the driveway, waving happily as they drove away, “Goodbye boys…have fun washing the castle!” With that, they were ready to bring joy to another dirty home owner…assuming it’s the house that needs the wash – Stewart Housewashing can clean only so much. Stewart Painting does a terrific job and it was so quick and thorough. People thought we had reshingled our house.